A brooch a month. 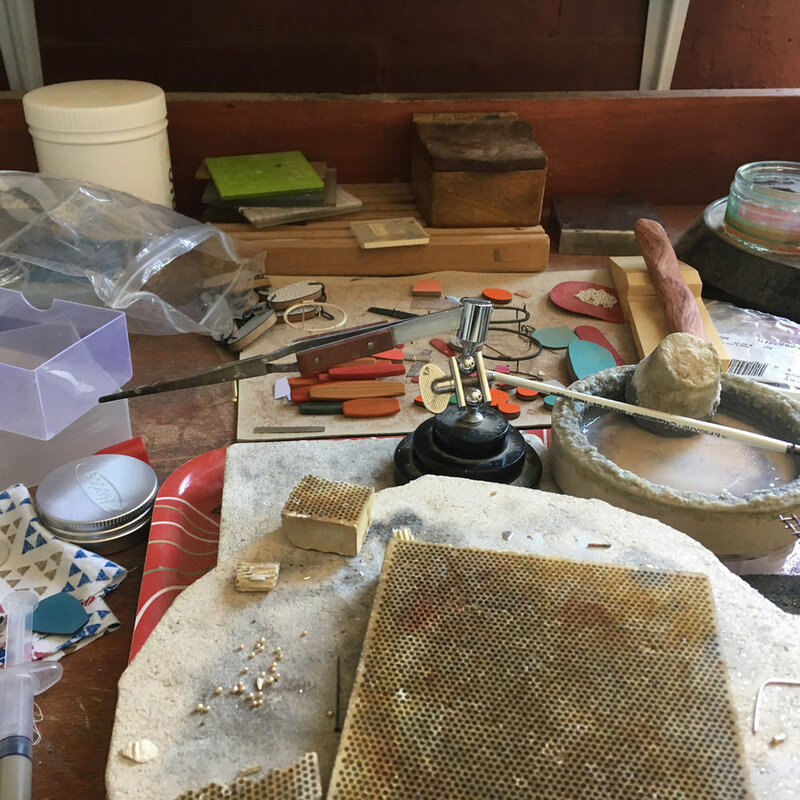 I am challenging myself to make more three-dimensional pieces, push my materials further and create some really exciting new work. 2018. 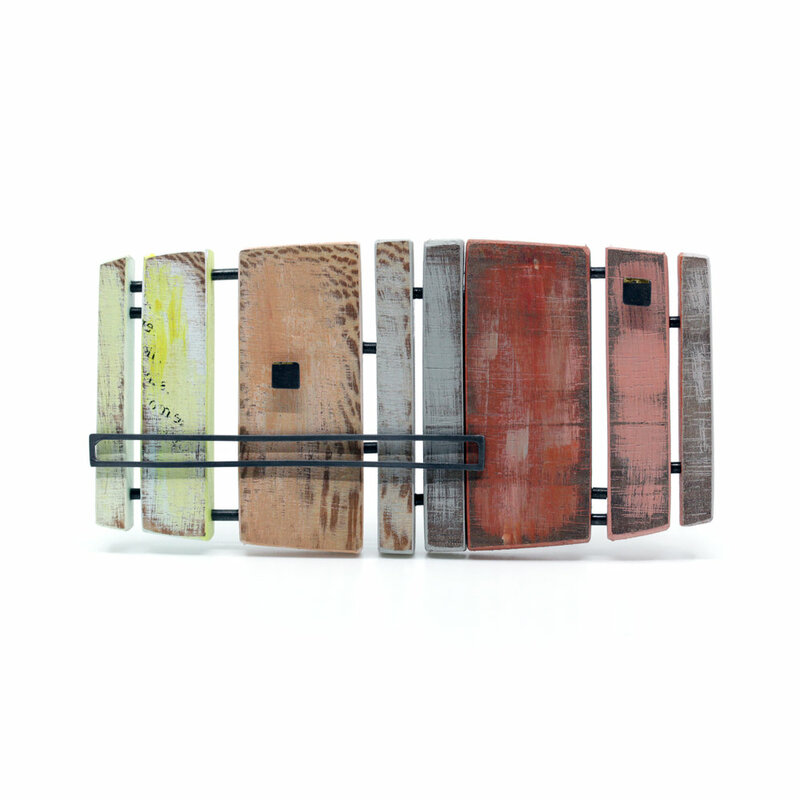 Lime wood, paint, oxidised silver, Keum Boo and steel. 75mm x 75mm x 35mm. Inspired by a postcard of Pendeen Blue '98 by John Piper. 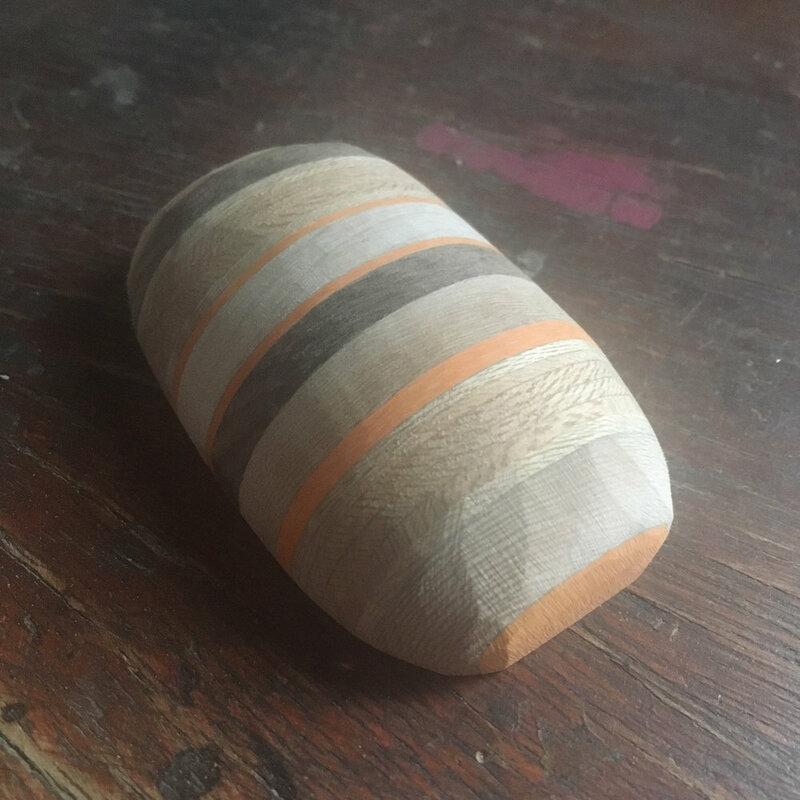 My first brooch of 12 for this project and I am really pleased to have tried two new techniques - hand carving wood and Keum Boo. 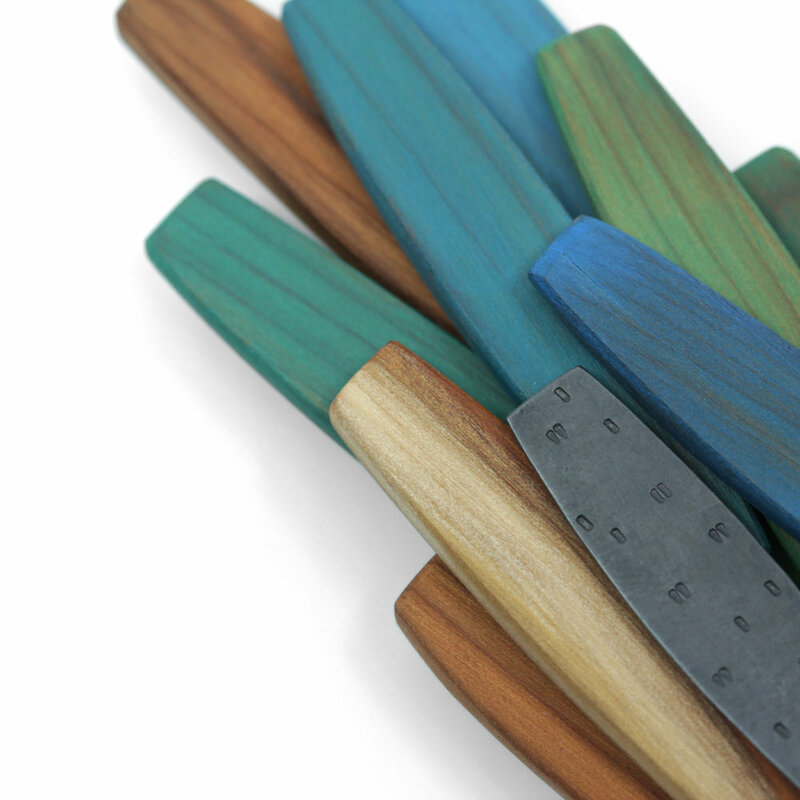 The carved shape of the wood is a nice change from the flat bases I usually work with I also love the blue. 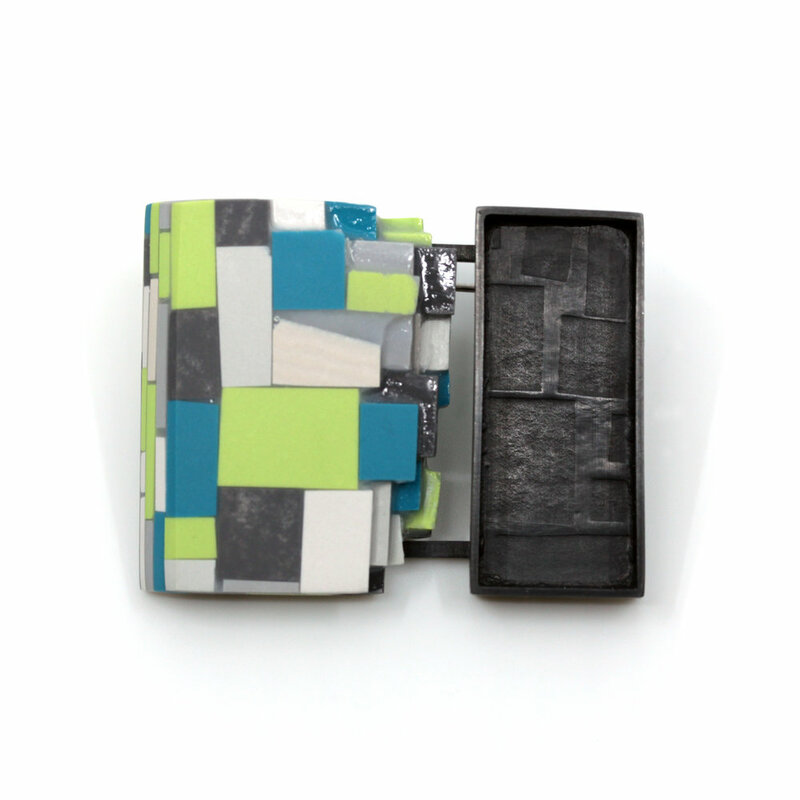 Oxidised silver, laminate, resin and steel. 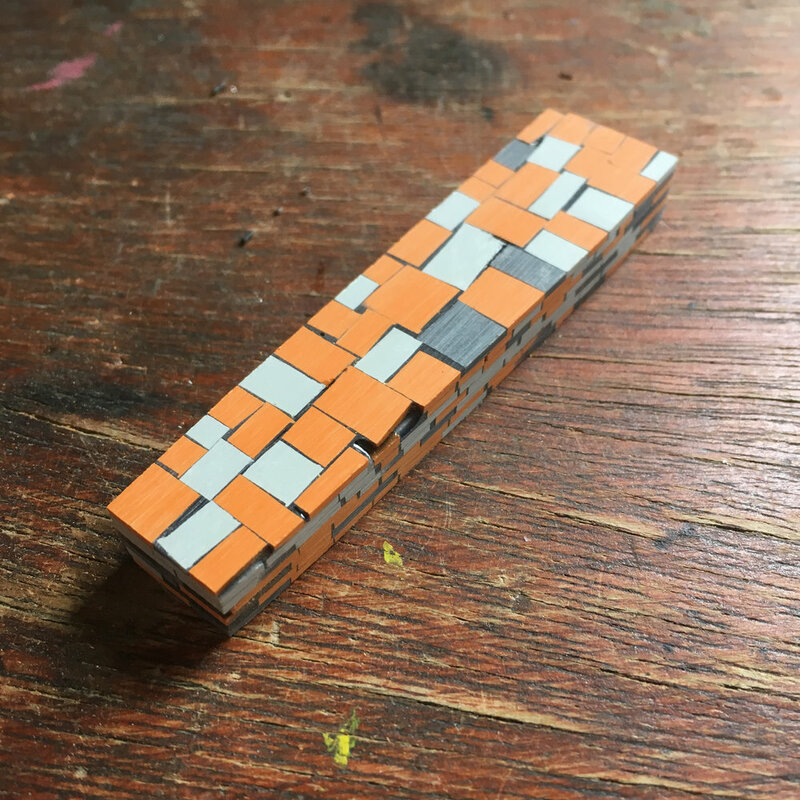 65mm x 63mm x 15mm. Inspiration came from an oil painting called Aspiring Forms by John Wells, 1950. I am really pleased with how this brooch has turned out and it feels like there is lots of potential for future development. The soldering was a challenge with my small gas canister torch but I got there in the end. The laminate sits in grey resin and the first time I did this I poured too much in - by the time I'd placed half the laminate the resin was oozing out! So I took it all out, cut new pieces of laminate and started again. Sometimes you only learn with experience! It was also lovely to look again at this painting by John Wells as it was the basis for one of my GSCE or A-Level projects nearly 20 years ago! Oxidised silver, laminate, resin, steel pin. 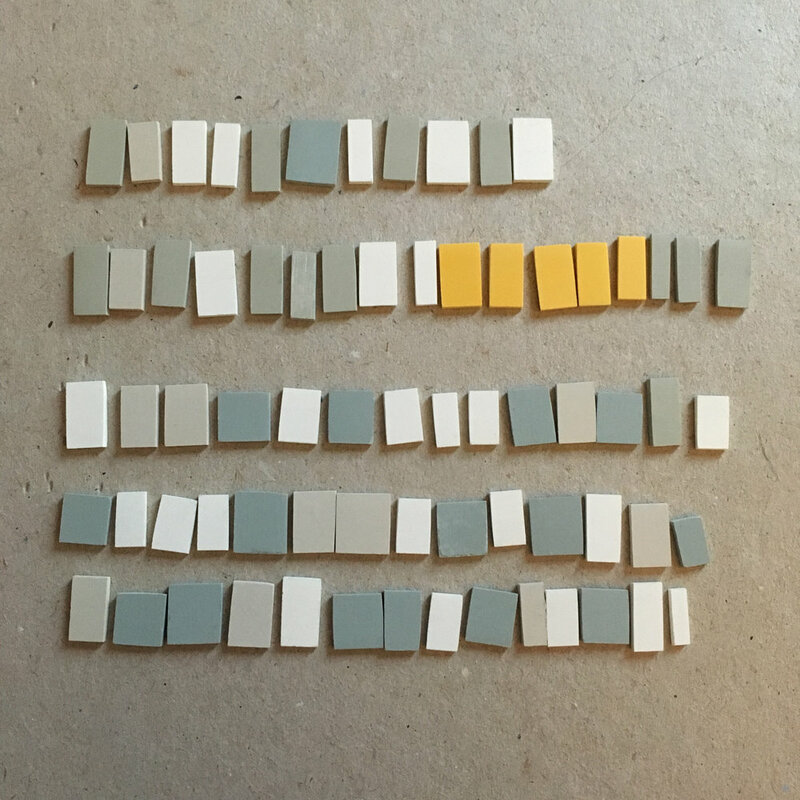 45mm x 35mm x 12mm. 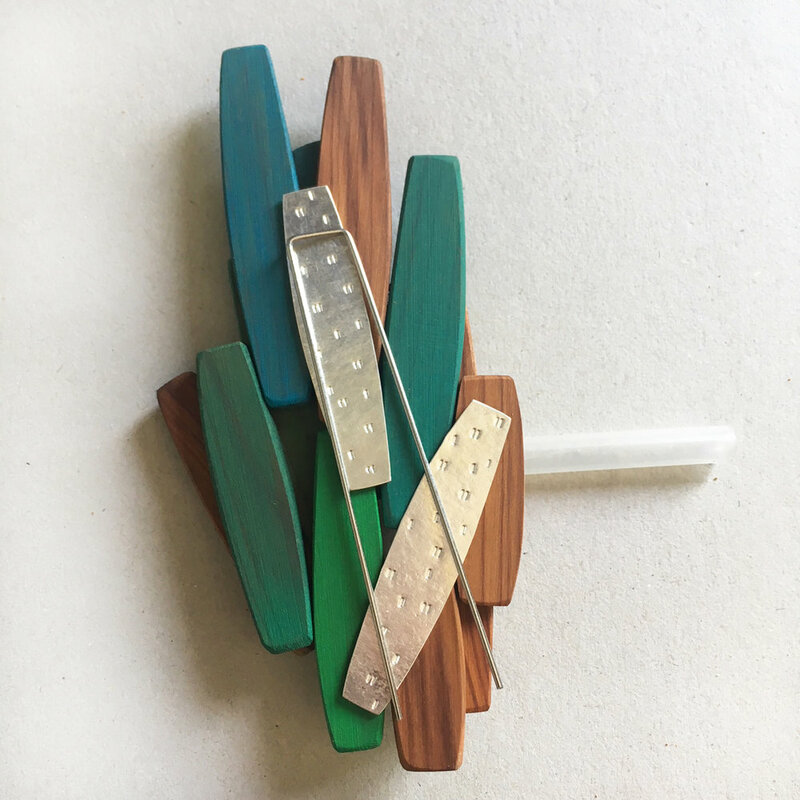 Inspiration for this brooch came from the materials I was experimenting with last month. I'd used too much resin last month so took all the little pieces of laminate out and left them in a heap, once they had dried they looked really cool together, so this month I thought I would develop the technique. 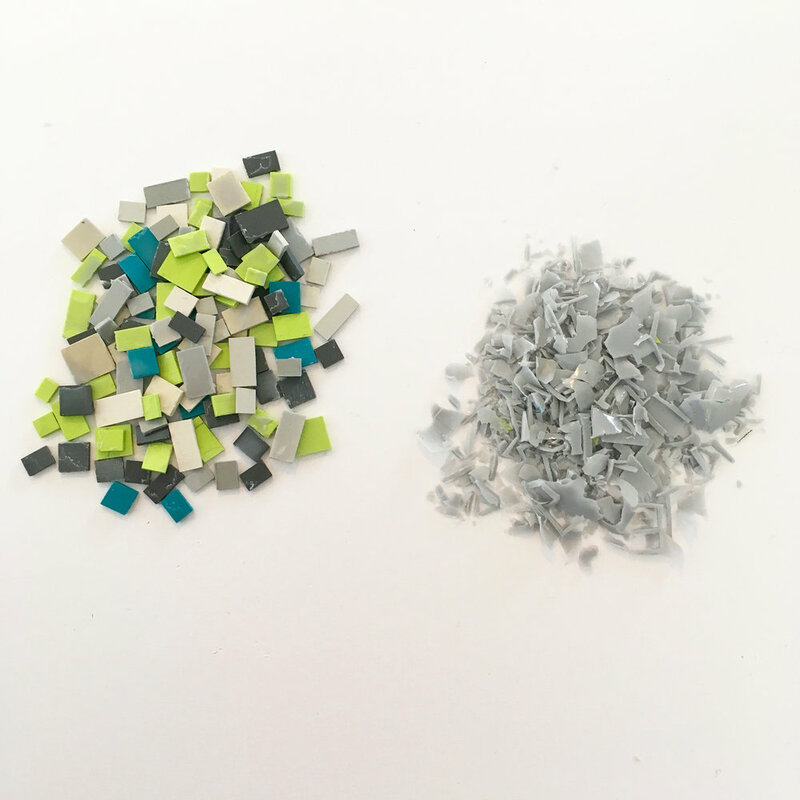 I started off by creating one layer with the plan of sanding the front and back to make a mosaic-like sheet, however, it was too fragile and I could only sand one side if I wanted it to be strong. That left me with an unfinished back that I wasn't anticipating and so then I had to think of way of covering it. I spent a day messing around with ideas but it didn't feel right! So I started again by picking all the resin off and decided to layer them like bricks for more strength. I was really happy with the result, I love the sanded sides which makes them so neat and smooth whilst showing the layering off well. Yew, paint, oxidised silver, steel pin. 107mm x 53mm x 20mm. 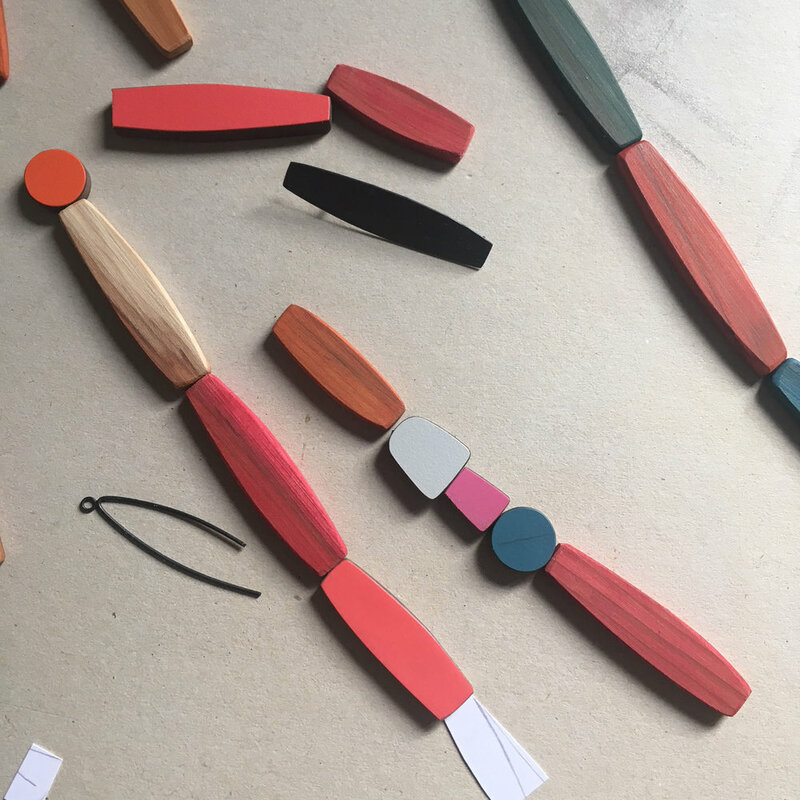 The shapes used in this piece come from an existing necklace design, they usually run one after the other however they look quite different clustered together in brooch form. 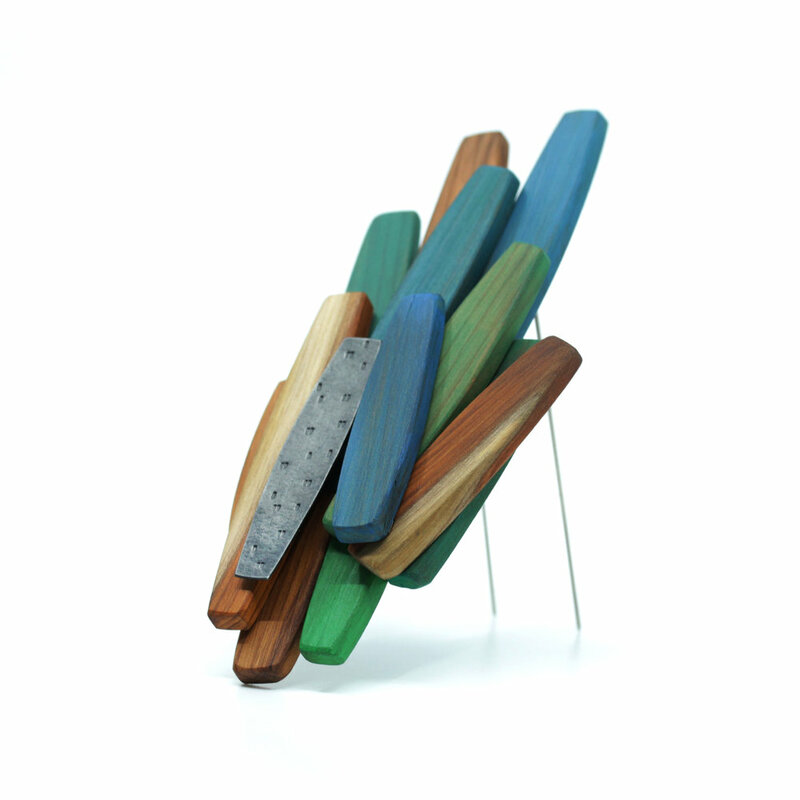 The colour palette was definitely influenced by a recent canal boat trip with blues and greens alongside exposed wood. I love the grain of the yew and how it also shows through on the painted pieces. It took me a few attempts with the brooch back and if I was to make something similar I would approach it differently next time! Yew, paint, oxidised silver, 9ct yellow gold. 123mm x 11m x 5mm. I'm still attached to the shapes and methods I used last month so I've used them again! It is great to move away from circular brooches, of which I've made a lot over the last few years, and this is really long and slim. 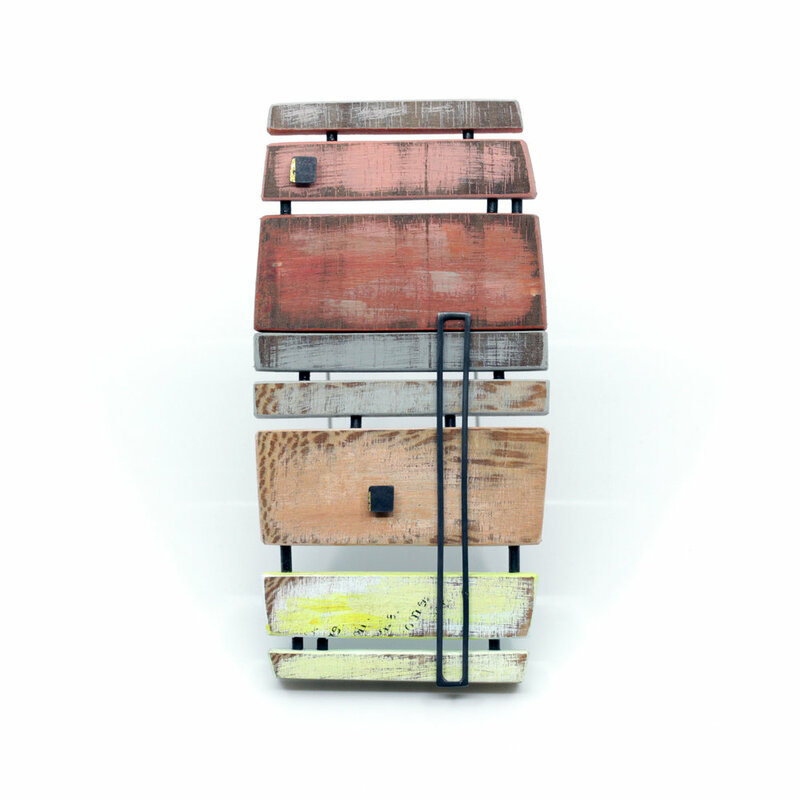 I love the combination of painted wood, unpainted wood and oxidised silver. 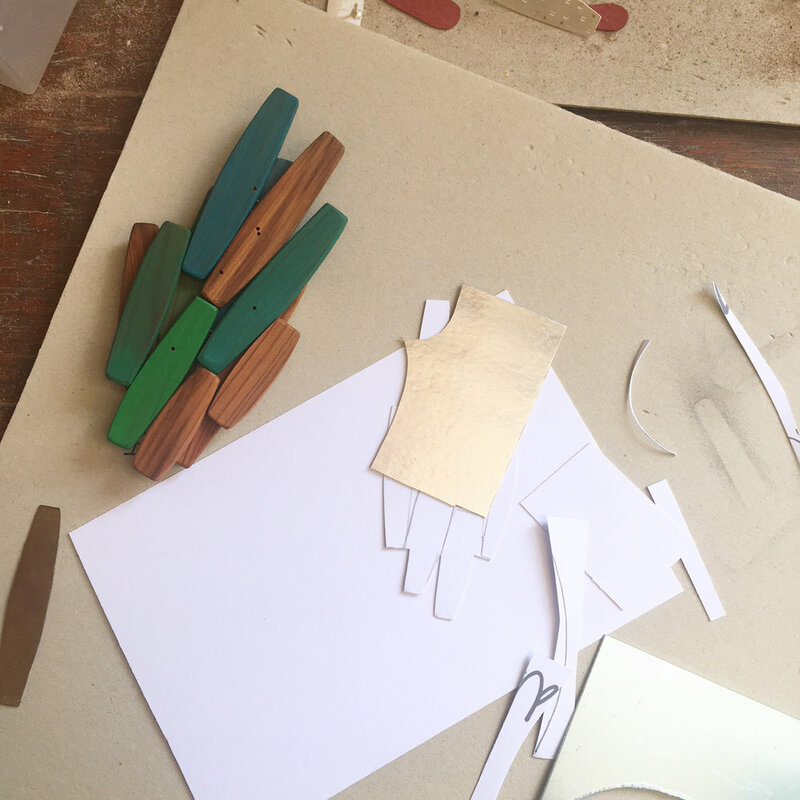 I wasn't sure how playful to be and considered introducing different shapes and even some laminate pieces. In the end it felt better to keep it elegantly simple, with the added detail of the gold granules on the bare yew. The oxidised silver shape at the end is fabricated, hollow and gently textured. 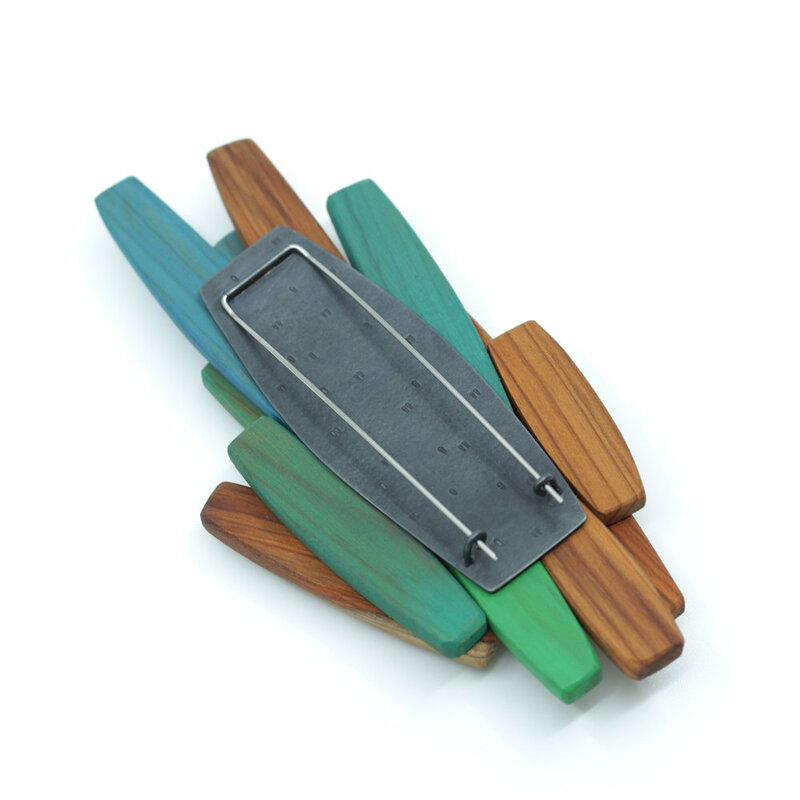 Wood (black American walnut and London plane), paint, oxidised silver, keum boo, steel pin. 105mm x 52mm x 7mm. This brooch took some trial and error! My starting point was a photo of a torn down warehouse in Chelsea Harbour by Tamasyn Gambell. I was drawn to all the shapes, colours and layers within the photo and I drew some simplified sketches from this. 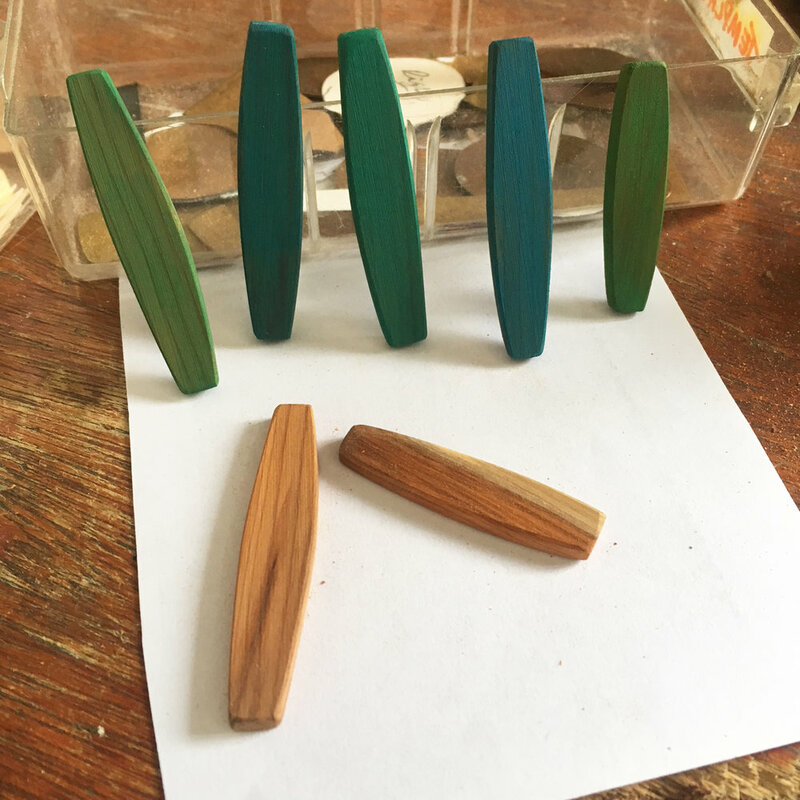 Choosing my favourite I then cut the same shapes out of three different coloured woods. Once I had all these shapes I began putting them in all sorts of different combinations quite quickly moving away from my original drawing. There were loads of ideas here and I may well explore some of them in future months. I ended up using quite simple shapes, painted them and joined them together. 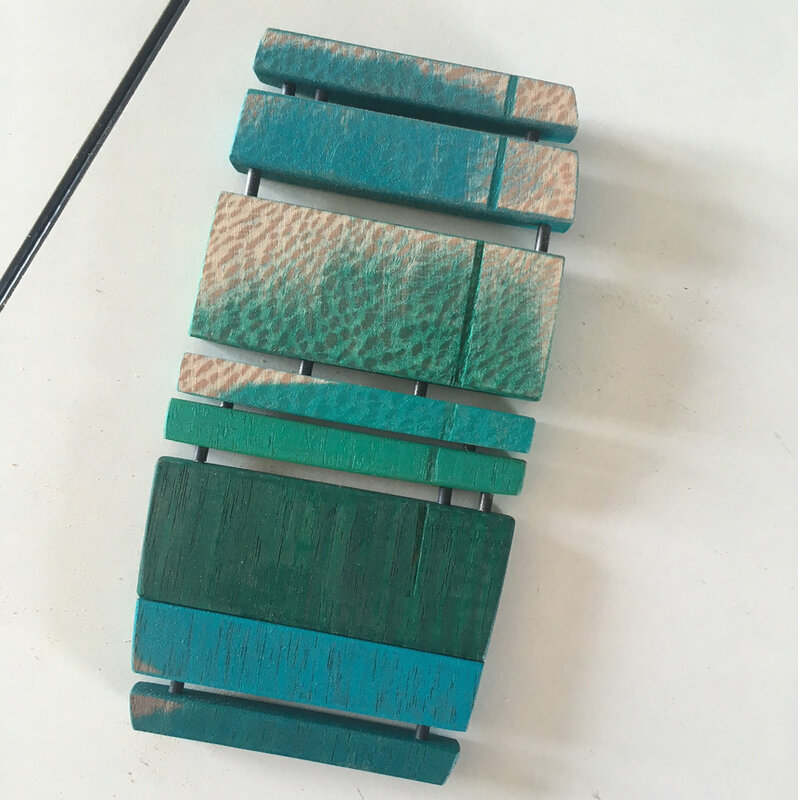 I chose blues and greens which I really liked however they completely covered up the wood which negated the point of choosing two contrasting woods. Also having joined them the piece was too flexible. So I started again! I went back to the original image and used that as the inspiration for my colour palette. I sanded the paint back, the rough look of which I usually struggle with in my work, but in this instance it worked well and reflected the torn down building. I used thicker wire to join the wood and this made the whole piece more stable. It was definitely a stronger piece for all the experiments and problem solving along the way. Wood (black American walnut, London plane), laminate, resin, 9ct gold, oxidised silver. 75mm x 47mm x 35mm. This brooch was made using some offcuts and unused pieces from last month. 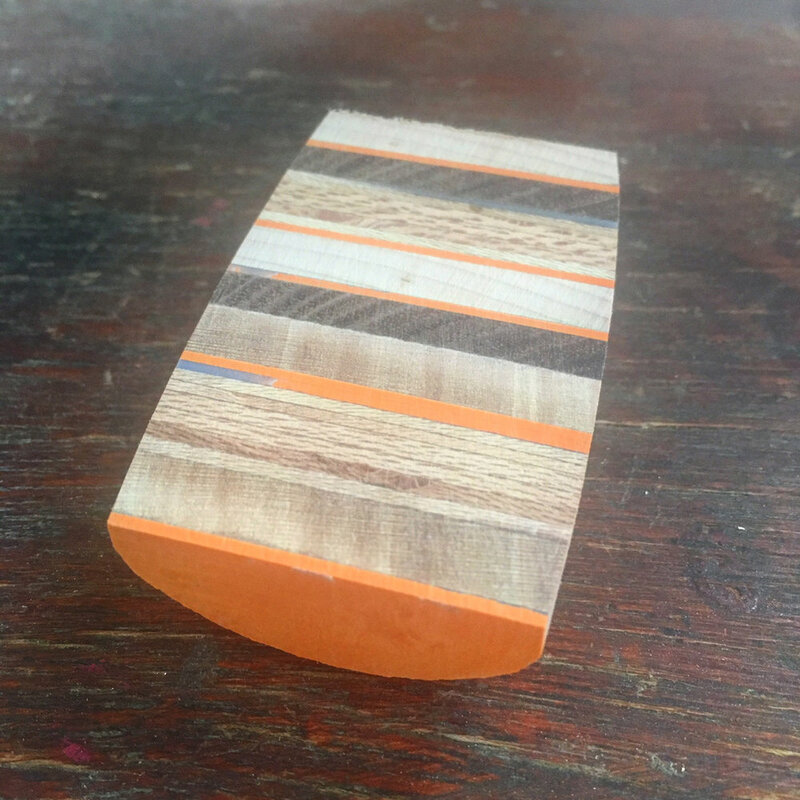 I have layered different coloured woods and orange laminate together - I love the stripes, I had great sticky fun gluing (it reminded me of making mud pies in the garden as a child for some reason!). I glued them with blue resin, however, this doesn't show up as much as I anticipated. It's got a slightly rough surface finish as I didn't want a completely perfect, shiny finish. 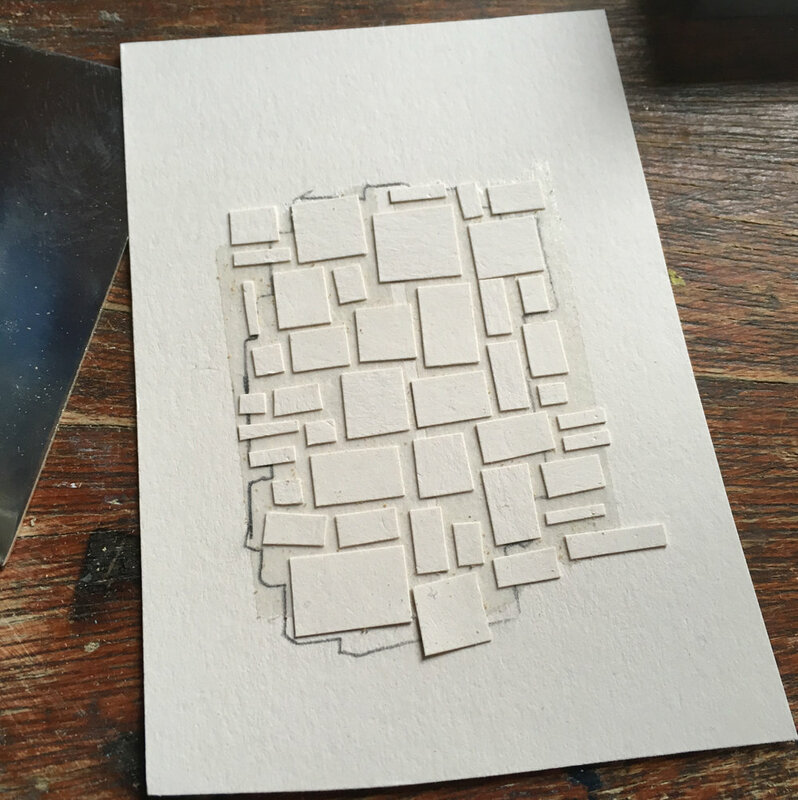 This month I revisited the technique I used for my March brooch - cutting tiny squares of laminate and setting them together in resin, this time a dark navy blue/black. I wanted to make a larger piece and then I kept sanding the shape until I was happy with the form. I felt it needed something more, so I cut it in two and added some wood. I ended up making a chunky pin out of the smaller piece, so two brooches this month! I love the brick like layers and pattern as well as the rough wood paired with the smooth laminate.